Shinigami-kun (TV Asahi, Spring 2014) is a live action TV adaptation of the manga by Endo Koichi ("Tsuideni Tonchinkan"). 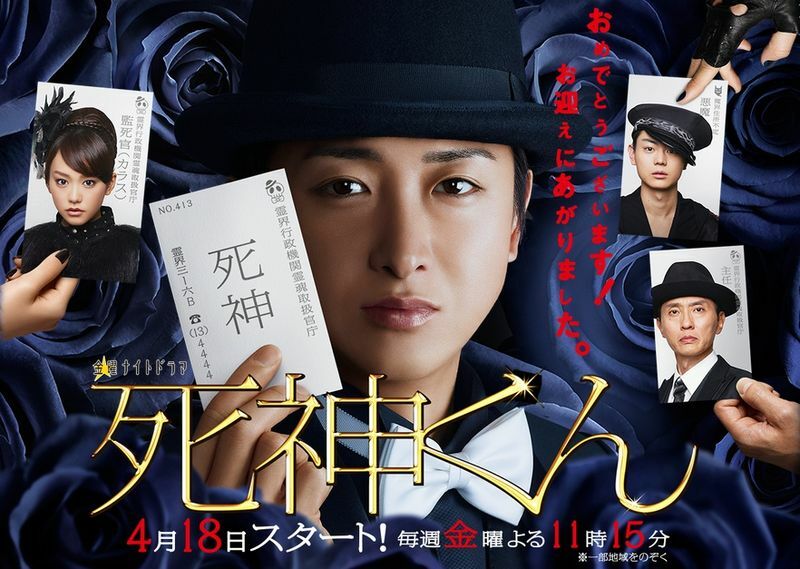 Ohno Satoshi stars in the title role of a novice Shinigami or "Angel of Death". He is known as "Shinigami No. 143" with the official designation of "Spirit World Administrative Body Soul Handling Authority". He visits and shows himself only to "Assigned-To-Die" humans who are under his care. Wearing a black suit, a bow tie, and a bowler hat, Shinigami-kun's responsibilities include informing these humans of their imminent demise, and escorting them to heaven. He can also prevent unscheduled deaths. However, the novice Shinigami would occasionally break the rules of the afterlife. The more Shinigami-kun goes about his tasks, the more he sympathizes with the humans facing death, thus he goes out of his way to accommodate their wishes. As a result, these actions as well as his occasional blunders and curious attitude, earn him the ire of his Monitoring Officer (Kiritani Mirei) who also transforms as a crow in the human world. Complicating matters for Shinigami-kun, are the mischievous Akuma or "Devil" (Suda Masaki) who competes with him in taking human souls in exchange for three wishes, and his other boss called "The Chief" (Matsushige Yutaka) who also keeps a watchful eye on him. Click on Feather icon for subs; and Skull icon for Drama Notes. Final Ep. 9: "Farewell kind Shinigami!! Be with me for my final moments"
Episode 8: "Last Chapters!! Green bell peppers and my way of life"
Episode 7: "Battle of the Empresses of the Entertainment World...!? Last song of a glorious popular singer"
Shinigami and his Monitoring Officer are in danger of losing their lives. Their boss, the Chief tells them that if they commit one more blunder, their lives will be cut short. Meanwhile, Akuma strikes again, this time choosing a victim from the entertainment world. She is Tachibana Yukari (Shimizu Kurumi), a popular singer-songwriter. Yukari wants to be famous again after years of not having a single hit. She also hates a certain singer whom she claims has been imitating her, and had robbed her of her fans. She is Nakano Ami (Yuzuki Fuka), the current popular singer, who says she idolizes Yukari... Can Shinigami and his Crow Officer manage to stop Akuma from taking another life, as well as, to save their own? Episode 6: "Great at deceiving?! ~A good woman financing a marriage swindler with 10 million yen"